RDR-HDC100 / 300 / 500 as sold in Australia have a minor issue with the EPG/Timer Recording function in some areas of Australia. In order to resolve this issue, we have provided a firmware update to version 1.15. This update also includes minor updates as shown below. Note: EPG is an abbreviation for Electronic Programme Guide. EPG timer recording sometimes stops before programme end. Dubbing to DVD does not work properly after editing A-B erase. Power off automatically by highlighting a certain HDD title at Title list screen. Improves performance of lip sync shift after DVD dubbing. DVD playability and disc format usability. WARNING: Please confirm your recorder’s model name on the front panel. Use a good quality branded blank CD-R disc or completely erased CD-RW disc to burn the firmware update. The recorder may not be able to correctly read a dirty disc or a disc with scratches. You need a computer with a CD-R or CD-RW writer with burning software. Power on the television and make sure it is tuned to the inputs to which the DVD recorder is connected. Power on the DVD recorder. The firmware version currently installed on the DVD recorder will be listed on the television screen as Software version:. If the version number is 1.15 or higher, your DVD recorder does not need to be updated. To exit, press the SYSTEM MENU button. Please read all the information carefully and thoroughly before downloading and installing any file. Failure to follow the instructions may cause the DVD Recorder to be unresponsive or to require repair. 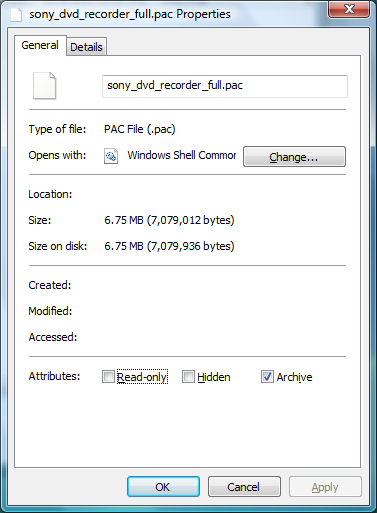 When the update is complete, check that the file is 7,079,012 bytes. Burn the update file onto a new blank CD-R or completely erased CD-RW disc using disc-at-once mode and ISO 9660 CD-ROM file system format. - Make sure that the disc is finalized. - Make sure the disc creation was correctly done without any error. In case of doubt, recreate a new update disc. - Burning the update disc using a packet writing software is not supported. (Packet writing is an optical disc recording technology used to allow writeable CD and DVD media to be used in a similar manner to a floppy disk). - Do not create the update disc using another process than the one described above. Do not turn off the DVD recorder or disconnect the DVD recorder from the power supply during the update process. Doing so may damage your Recorder and make it unusable, and would require a repair of the DVD recorder. Do not press any button, except as instructed, until the update is complete. The firmware update process may take up to 4 minutes. First read the whole procedure before starting to update the firmware of your DVD recorder. The disc tray will automatically open during update. Please remove anything that could potentially obstruct the disc tray before updating. Make sure that your TV set is correctly connected to your DVD recorder. Power on your DVD recorder by pressing POWER button. Press OPEN/ CLOSE button to open the disc tray. Place the update disc on the disc tray. Press OPEN/ CLOSE button to close the disc tray. Do not perform any operations until update completes. Select Yes. Press the ENTER button of remote. The update starts automatically. A updating scroll bar appears on the TV’s screen. After software updating finishes, the tray opens automatically. Press Power button to power off the set. Note: If an error message appears, power off your DVD Recorder and repeat the update procedure from the beginning. *1: If the tray doesn’t open automatically and a TV’s screen display a updating message again, select No. Press the ENTER button of remote. Remove the disc. Go to step 9 above. The firmware version currently installed on the DVD recorder will be listed on the television screen as Software version:. If the version number is 1.15, your DVD recorder was updated successfully.